SOFIA (Bulgaria), February 8 (SeeNews) - After reaching a historic agreement with Greece to change its name, Macedonia made a major step towards joining the North Atlantic Treaty Organization (NATO) this week. Meanwhile, a subsidiary of Italy's Fintel Energia Group announced plans to start the construction of Europe's largest onshore wind farm in Serbia. The week brought some good news for two stock exchanges in the region, as a cybersecurity company and a real estate developer unveiled plans to go pubic, while a biometric identification security solutions provider issued details of its earlier announced intention to make an initial public offering. Following are the details on some of the top stories from Southeast Europe this week. NATO said on Wednesday its member states signed an accession protocol with Macedonia, following a historic agreement between Skopje and Athens to change the name of the former Yugoslav republic. “The accession process now moves to the capitals of the 29 Allies where the Protocol will be ratified according to national procedures,” NATO said in a statement, after the permanent representatives of the members of the Alliance signed the document at its headquarters in Brussels in the presence of foreign minister Nikola Dimitrov. . 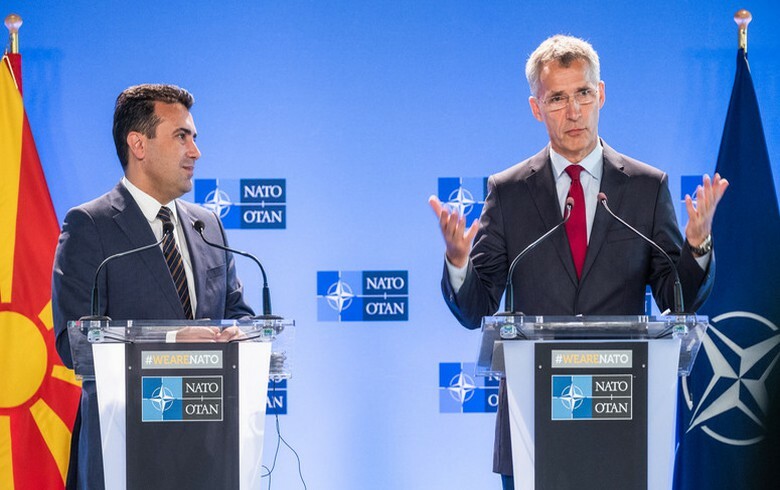 The country, under its new name of Republic of North Macedonia, will become the 30th member of NATO once all allies have ratified the accession protocol, the Alliance noted, adding that Skopje can now take part in NATO activities as an invitee. “NATO keeps almost one billion citizens across Europe and North America secure and with you [Macedonia] joining NATO there will be thirty countries committed to protect each other. Your accession will bring more stability to the Western Balkans. This is good for the region and for Euro-Atlantic security,” NATO secretary general, Jens Stoltenberg, said after the signing ceremony. "We are here and we are ready to assume our responsibilities," Macedonia's foreign minister Nikola Dimitrov said before the signing ceremony. On February 1, the Greek parliament ratified the agreement with Skopje to rename the former Yugoslav republic to North Macedonia, thus unblocking the path for the country to join NATO and the EU. Last month, Macedonia's parliament endorsed four amendments to the constitution on renaming the country to North Macedonia, delivering on Skopje's commitments under the agreement with Athens signed in June. Fintel Energija [BEL:FINT], the Serbian subsidiary of Italy's Fintel Energia Group, said on Monday it plans to start the construction of Europe's largest onshore wind farm in Serbia. The wind farm will have an installed capacity of 572 MW and will be located in the northern Serbian region of Vojvodina, Fintel Energija said in a filing with the Belgrade Stock Exchange. Fintel Energija plans to develop the project via the special purpose vehicle Maestrale Ring. The company also plans to build in Vojvodina an additional two wind farms of 10MW installed capacity each, through special purpose vehicles Lipar and Lipar 2. The three special purpose vehicles will be fully-owned by Fintel Energija. Romanian cybersecurity company Safetech Innovations said on Thursday it is planning to list on the AeRO segment of the Bucharest Stock Exchange (BVB) this year, after doubling its profit in 2018. The company posted a turnover of 7 million lei in 2018, down from 8 million lei in the previous year. The drop in the revenues was expected by the management and was due to a change in the strategy of the company, which is now more selective in terms of the projects it delivers to clients, Safetech said. Established in 2011, Safetech Innovations is an information security company specialised in the field of cybersecurity. Its services include data protection, identification of vulnerabilities and risks, implementation of cybersecurity solutions and measures, response to cybersecurity incidents as well as creation of organisational culture oriented towards safety. News of two planned listings came from Bulgaria, where local company Green Town Projects said that it intends to launch an initial public offering (IPO) on the Bulgarian Stock Exchange, aiming to raise 8 million levs ($4.6 million/4.1 million euro). The company is planning to offer 8 million newly issued shares of 1 lev in par value each at a price of at least 1 lev, documents entered into the commercial register on Tuesday showed. Green Town Projects intends to use the proceeds to form an investment portfolio consisting of flats and residential complexes, stakes in real estate investment companies and companies offering real estate-related services, as well as stakes in companies outside the real estate sector. The company's registered capital amounts to 50,000 levs and is fully owned by private individual Shtilyan Stoyanov. On Monday, another Bulgarian company - biometric identification security solutions developer Biodit Global Technology - said that its shareholders have approved the management's proposal to offer 2.2 million shares for subscription in an IPO. The shares, which carry a nominal value of 1 lev ($0.58/0.51 euro) each, will be offered in the price range of 1.0-1.1 levs, Biodit Global Technology said in a filing to the Bulgarian commercial register.